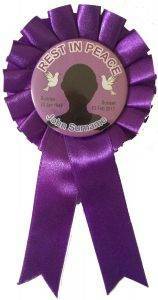 If you are celebrating the life of a loved one who has recently passed away – whether at a funeral service or memorial sevice – then we can produce funeral badges, ribbons or rosettes for the attendees. 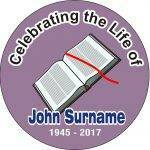 It is a fitting tribute to anyone’s life to see all the people who meant so much to them during their lifetime, wearing a badge or rosette. It shows respect and support for the family. And helps to bring everyone together to celebrate and give thanks for the life, rather than dwelling on the sadness of the occasion. If you want to have as rosette, which is proving to be a very popular way to commemorate a life, then we can quickly produce a rosette to suit your particular colour scheme. This could be a selection of colours from the flag of the country where the person was born. It could be the colours of a favourite team or society. Whatever colour scheme you require then we can quickly produce a suitable funeral rosette from our in-house production to quickly suit the occasion. To order a rosette or badge, just select the design you want. Then send us the appropriate details. If you want to include a photograph then either attach this to the order or send it separately by email. Finally make sure that you tell us the absolute latest that you require the order. We normally try and despatch the orders within 24 hours. But it is always useful to know if there is an urgency with any particular order. View our funeral rosette designs. An alternative suggestion for a funeral service or for a memorial service is to have ribbons with a simple supporting message. Choose your own wording – which can be personalised if you wish. 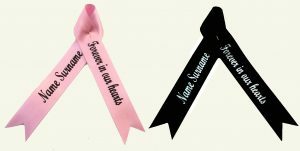 The ribbon is available in a range of colours and the text can be printed in metallic silver or gold colours or in a standard black.